On Saturday, 9 May 1892, Hazel Annie Chisholm was born to Sarah Ann Chisholm (nee Wood) at their home in Alma Street, Rockhampton (Births, Deaths, Marriages, Queensland, Reg no: 010514). Her husband, Alfred Wilson Chisholm, was delighted at the birth of their first child and placed a birth notice in the Daily Northern Argus where he worked as a compositor and proofreader. Birth Notice for Hazel Annie Chisholm inserted in Daily Northern Argus on 16 May 1892. Twelve months later they welcomed the arrival of another girl, Ethel Edith Chisholm, on 18 July 1893 (Births, Deaths, Marriages, Queensland, Reg no: 010213). 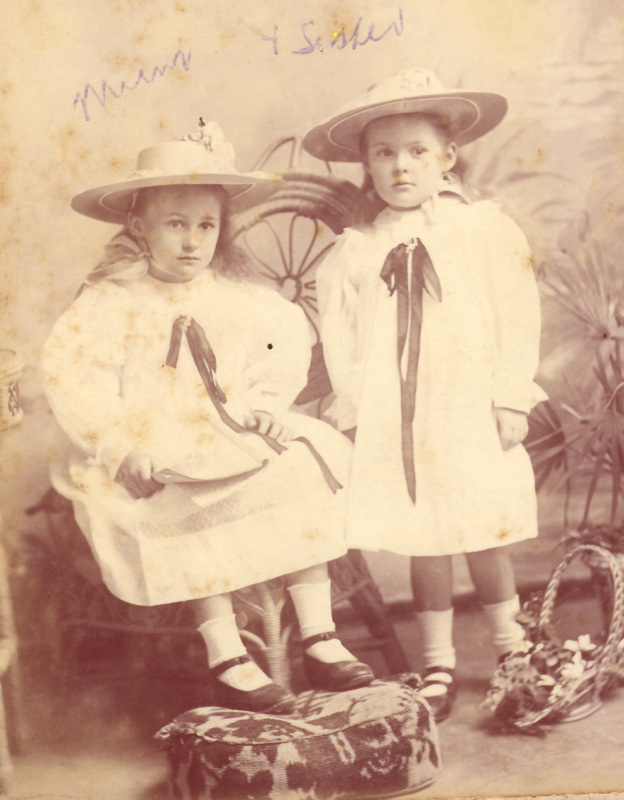 The photo taken around 1899 shows them in their “Sunday best”, probably made in a crisp white fabric which was the fashion dictum of the period. Little girls had to contend with layers of petticoats, profuse frills, wide-brimmed hats and given the family’s position in local society, would not be seen in public without hats and shoes especially on Sundays. The handwriting identifying each of the children was done by Hazel’s daughter in the 1960s. Her brother, Albert Joseph Chisholm, was born in April 1900 (Births, Deaths, Marriages, Queensland, Reg no: 010259). The new century seemed to augur well for the family. Her father continued with his involvement with the Waratah Football Club and other community organisations. Unfortunately, this was to come to an end in April 1902 when their father lost his job due to a wager that reflected badly on his position as a journalist and they moved to Cairns where he obtained a position with the Cairns Argus as a journalist. The children continued their education at the Cairns State School (Morning Post, 2 July 1906. National Library of Australia. http://trove.nla.gov.au/) with Hazel receiving an award for perfect attendance and Ethel, a prize for composition. The photo shows the school and its students in 1886. By 1906, when Hazel and Ethel attended, enrolments had increased dramatically, with 229 boys and 218 girls enrolled, There were calls for additional teachers due to the increased enrolments at the time they attended and hopefully the school buildings had been extended by this time as well. 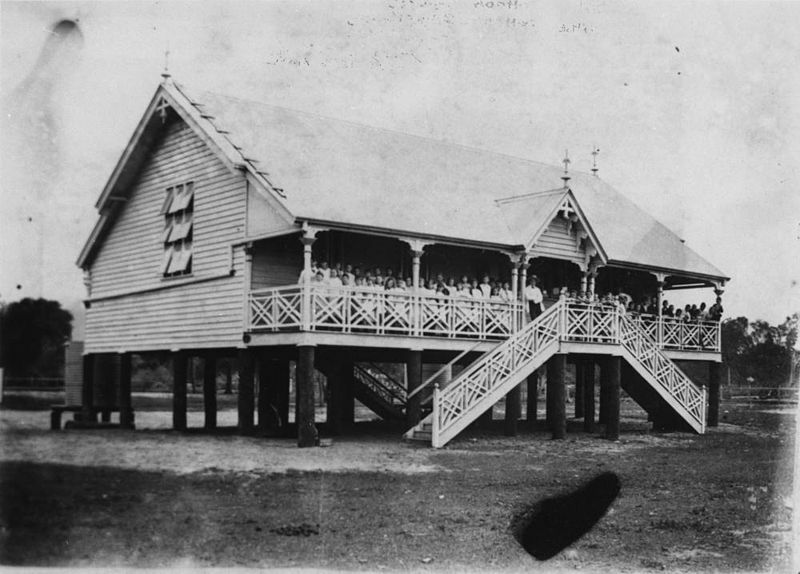 Cairns State School 1886 when the school opened. John Oxley Library, State Library of Queensland. In 1908 the family had moved to Brisbane (Australian Electoral Rolls, 1901-1936). 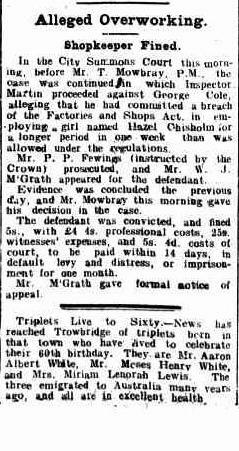 Hazel’s father was no longer able to provide a reliable means of support for the family, possibly due to alcohol abuse (Telegraph, Brisbane Qld, 4 July 1913). Electoral rolls show that they had moved in with her maternal grandparents initially. Based on the electoral roll records for 1913 they were now living at McDougall Street, Milton. It appears that her father had separated from her mother shortly after this record and according to oral family history, her mother had taken in boarders to help support the family. At the turn of the century, women had a very stereotypical role in Australia. While single, they did work, usually in some form of service such as working as a waitress or domestic with an expectation that they would marry and then stay home and look after their husband and children while he brought in a weekly wage. Hazel followed this pattern and by 1908 when she was 16 years old she obtained employment as a waitress at a “refreshment shop” known as Cole’s restaurant at 368 Queen Street, Brisbane. A reasonable proportion of the women employed in refreshment rooms were young, starting out between 15 and 16 years of age. They held various positions at different times – employees could work as barmaids, waitress, cooks and generals, often moving up and down the hierarchy at different postings. They were paid according to the job they were doing rather than the skill level they had. There are few records before 1917 but in 1918, the going rate for a 48 hour week for a waitress was between 15 and 27 shillings. Conditions of employment were not always followed and in a newspaper report in 1909, her employer, George Cole, was charged with a breach of the Factories and Shop Act for employing her for “a period of longer than 53 hours” in one week. (The Telegraph (Brisbane, Qld. 1872 – 1947. Tuesday 20 April 1909). As she was now contributing towards the financial support for the family the case, fortunately, did not prevent her from continuing employment as a waitress, with her marriage certificate lists her occupation as a waitress in 1914. 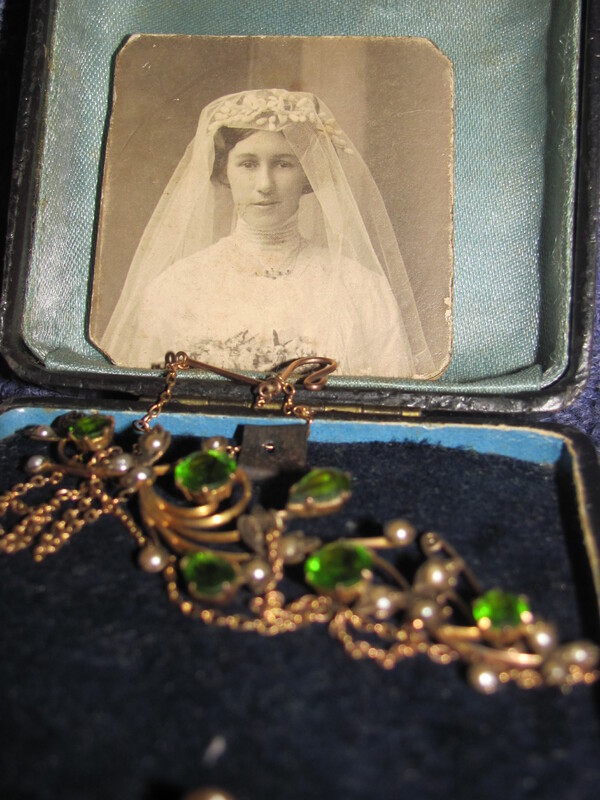 Bridal photo and wedding gift from the groom to the bride, Hazel Annie Chisholm/Shute. Biggs family private collection. Held by C M McGregor. Digital image was taken by C M McGregor in 2014. It would appear that after the wedding they agreed to make their home in Brisbane. Following their honeymoon the couple rented a place at Merivale Street, South Brisbane furnishing their residence on time payment. 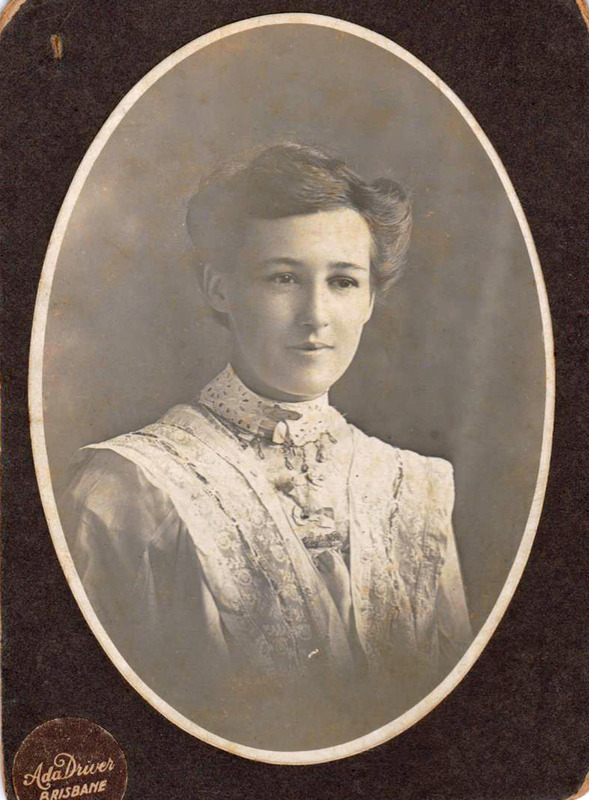 Her husband returned to Muttaburra for work and provided her with some financial support until his trip to Brisbane when he arrived on 13 November, just over four months after their wedding. He wanted her to return to Muttaburra with him but Hazel was reluctant to do this. He returned to Muttaburra without her around the end of November unhappy with her refusal to accompany him. It is difficult to confirm his earning capacity in Muttaburra. In an ensuing magistrate’s hearing, in January 1914, William admitted he had not sent her any money since November, as he had promised, to help pay off the furniture as he did not have it to send. He had not been able to work due to an infected hand and he did not think he was bound to support her when she would not live with him. He only had 10 pounds to his name without borrowing and the last time he was in Brisbane he had to borrow 30 shillings from his wife for his fare. Hazel Annie in the hat she wore to magistrate’s hearing (minus the flowers). Photo was taken October 1913. Biggs family private collection. Original held by C M McGregor. Digital Copy taken by C M McGregor 2016. 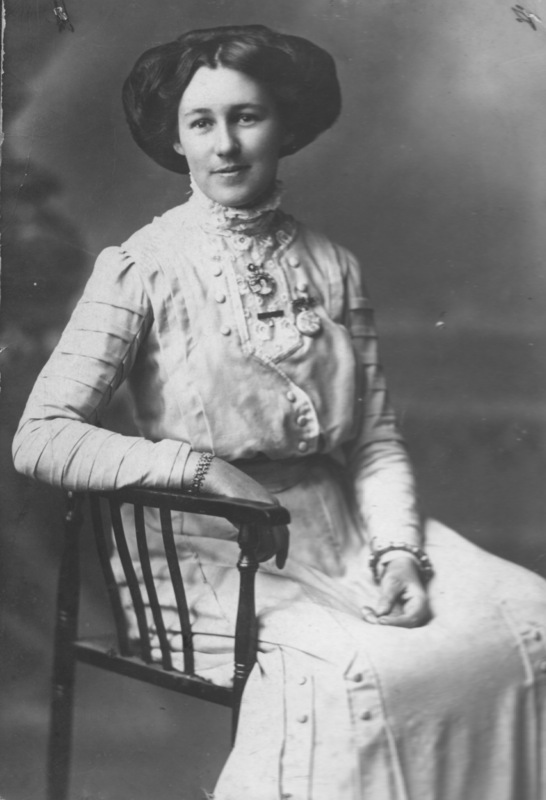 Due to her ill health, distress at his conduct and as he was still living with his parents and nine brothers and sisters at Muttaburra, Hazel refused to move to Muttaburra to live with him. Under the Married Women’s Protection Act 1896 a woman was allowed to apply to a magistrate to release her from living with her husband and make orders allowing for her protection, custody of the children and maintenance if he found the husband guilty of cruelty, desertion or adultery or of failing to make adequate provision for the wife and children. Having taken the matter to court the magistrate instructed the couple to “come to some amicable arrangement” and adjourned the case until late February. At the next hearing, an agreement had not been reached and a request for a maintenance order against her husband was dismissed as Hazel refused to live with her husband in Muttaburra. An almost full page article on page 2 of the “The Truth”, on 1 March 1914, including sketches of both Hazel and William, salaciously detailed their court case under the banner headlines of “Shute the Shunted” and “Hazel Hauls Him Home”. This would have undoubtedly caused great distress to Hazel and both the Chisholm and Shute families. Not long after the court case was dismissed Hazel realised that she had fallen pregnant. On 5 September 1914, she gave birth to their daughter, Hazel Edith Shute. Another article in the Truth newspaper (20 December 1914) details a legal attempt made to gain maintenance. Her husband sort to have the order varied or squashed as he considered that the child was “of doubtful parentage” and that his wife refused to live with him. After hearing evidence from both sides, the magistrate ruled in favour of his wife Hazel. 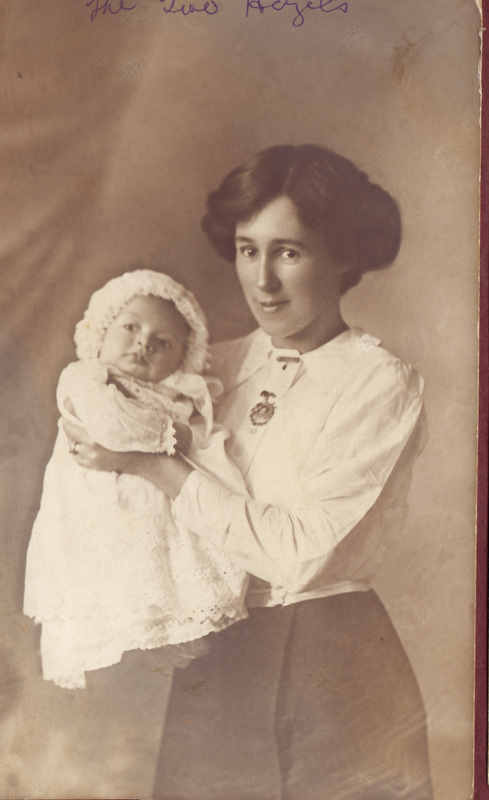 Hazel and her baby daughter, 1914. Biggs family private collection. Original held by C M McGregor. Digital copy taken by C M McGregor, 2014. With neither father nor husband for support Hazel and her mother, Sarah lived together at “Walton”, 19 Hope Street. Spring Hill. Taking in boarders appears to have been their main means of support during this period, both Hazel and her mother are listed on the electoral roll as doing home duties. At times money was very short and her daughter recalled both the wedding gifts of necklace and bracelet having to be hocked to tide them over and later redeemed when their situation improved. One of the boarders in her mother’s household was John Joseph (Jack) Doherty, described as a steelworker in the electoral roll for 1913. He had travelled from Sydney to Brisbane and appears to have been fairly itinerant to enable him to find work. He boarded in her mother’s household from mid/late 1913. 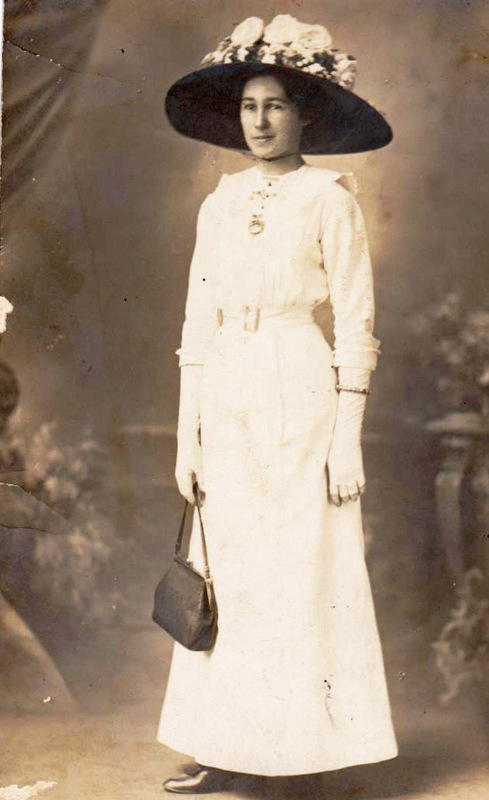 Hazel had given him “a photo in remembrance” of herself dated 2 November 1913 when he left to find work once again. According to the electoral roll, Jack had again taken up residence with the family around May 1914. Based on oral family history, given by her daughter, he was also present in the household when Hazel’s daughter was born in September and celebrated her arrival. World War I loomed and when Jack enlisted in January 1915 leaving their household once again. It is clear particularly from one postcard photo of herself with poem and words written on the back that Hazel was now deeply in love with Jack. The old old story ever new I have told my love for thee in these lines would tell again how dear thou art to me. The next few years were to see many changes in the family. In 1915, Hazel’s sister, Ethel Edith, married Francis Joseph Pitt and moved to Red Hill having their first child 12 months later. 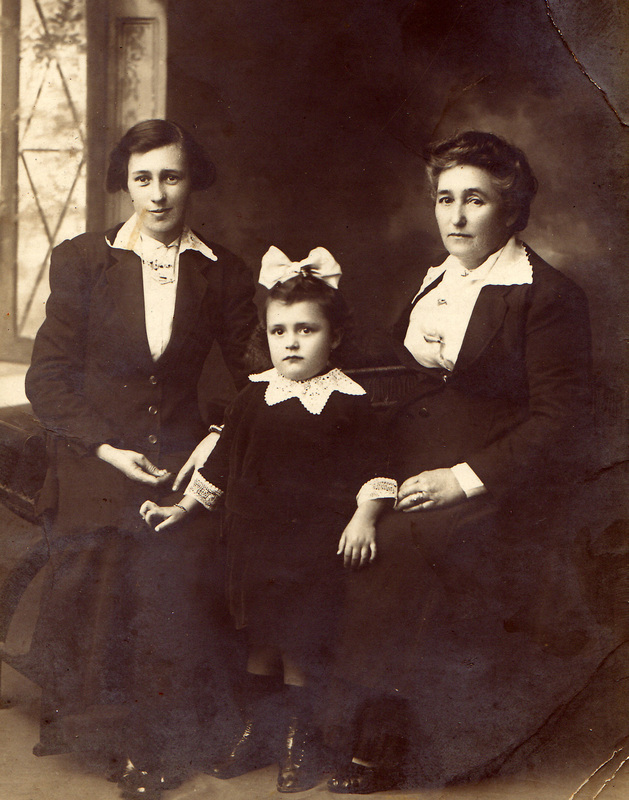 Hazel, her mother Sarah, and brother Albert moved in 1917 to “Poneke”, Railway Terrace, Milton. Hazel’s maternal grandfather, who had given them support when they first returned to Brisbane, died in the same year on 15 May 1917. Her brother, Albert, was anxious to join the war effort and he left home in September 1917, enlisting at just 17 years of age to fight in WWI. As he was underage his enlistment required his parent’s written agreement. In a letter to the enlistment officer, Sarah states that she agrees to his enlistment in the absence of his father whose whereabouts have been unknown for some time. In July 1918 Albert was seriously wounded in France and repatriated to England for treatment. His mother was notified but it was not until 20 May 1919 that Albert returned home from the war. The wait to see their son and brother must have been almost unbearable. Life had to continue on during the war and a means of support found so Hazel and her mother continued to take in boarders. In 1919 John Joseph (Jack) Doherty returned to Brisbane, working as a milkman and once again was living with Hazel and her family. By 1921 the electoral roll shows that Albert was sufficiently recovered from his injuries to return to work as a clerk and remained living at home with his mother and sister until 1925 when he took up his first appointment as a Baptist minister at Murgon. Hazel was recorded on the electoral roll as Mrs Shute up to 1921. Divorce was difficult and women had little legal protection within a system that supported the continuance of marriage and a woman’s place in the home. Hazel was well aware of this due to her previous experience before the magistrate. Along with society and religious institutions that shunned or treated divorced women as an outcast and the prohibitive cost in seeking her freedom to remarry it is not surprising that there is no record of a formal divorce from her husband. In 1928 Hazel’s father, Alfred, returned to Brisbane from Cairns where he had been living and working as a journalist. Now suffering from a malignant growth on his tongue he was hospitalised and died on 24 May 1928. There is no doubt that Jack Doherty had become Hazel’s partner and welcomed as such by her mother. Hazel’s daughter grew up believing Jack to be her much-beloved father and considering herself to be a Doherty. 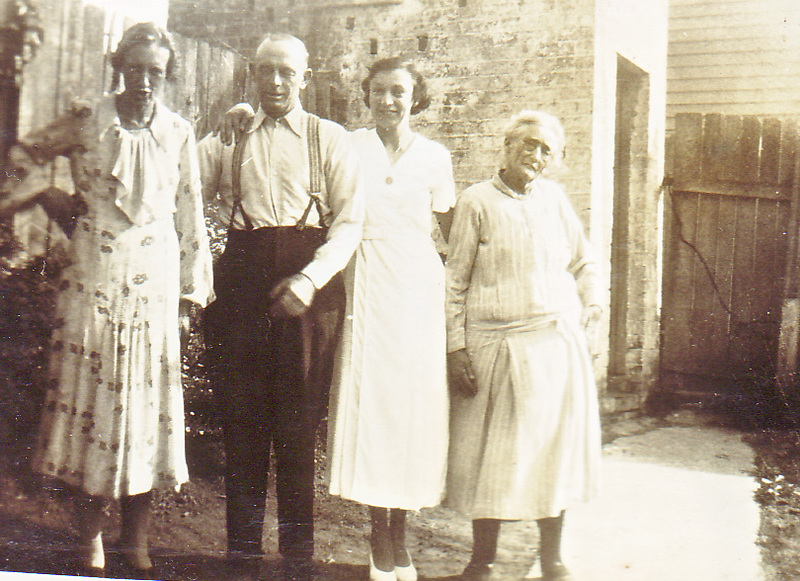 It was not until much later in life that she was told that her biological father was William Shute. Arch construction started on the Sydney Harbour Bridge in October 1928 and Jack took this opportunity to return to his trade as a steelworker/crane driver on the construction of the Bridge. There is no electoral record that can confirm the time that this occurred but it was probably shortly after the death of Hazel’s father. Hazel and her daughter accompanied him to Sydney and they rented a house at 67 Church Street, Croydon. The 1930 Electoral Roll records her name as Annie Doherty. In 1930 she moved with Jack and her daughter to 25 Emily Street, Leichhardt. The electoral roll shows that her mother joined them in 1930 and remained with them, at Emily Street, until her death in December 1939. Photos taken near the end of her life show Hazel as a painfully thin and sickly woman although she was only in her forties. Her daughter recalled visiting her in hospital on a number of occasions and from that oral history, it would appear that she had been plagued by an ongoing and lengthy illness. Her daughter recalls her having respiratory problems which were probably due to the growth of a goitre that was pressing on her larynx and causing problems with her breathing. She was hospitalised at Royal Prince Alfred at Camperdown and treated for toxic goitre (hyperactive thyroid) but died from this condition and cardiac failure on 31 March 1939. Her death certificate includes both her names, Hazel Ann Shute also known as Hazel Ann Doherty, with her partner John (Jack) Doherty as the informant. She was buried in the Catholic Section of Rookwood Cemetery on 1 April 1939 (Sect. M2 Row 15 Plot 1769). The grave is unmarked. Jack continued to care for Hazel’s mother until her death at the end of 1939. He also regarded her daughter as his own and she in return always considered him her father, much loved by her own husband and children and caring for each other until his death in 1954.